I have so many words to say about how saddened and heartbroken I am about what happened on Friday. I hated having to tell my children about what happened and to explain to them what to do if that were to happen at their school. I hated to see my 7 year old son put his hands up to his mouth and tear up when I told him that a bad man killed little kids his age. I hated hearing my kids talk about it later when it was just the two of them and consoling each other. I didn't want to think about what happened. I wanted to pretend that we didn't live in a world like we do. I don't want to know the reason why he would shoot up an elementary school. I don't want an excuse. So today as I write these words, I am going to stop being angry. 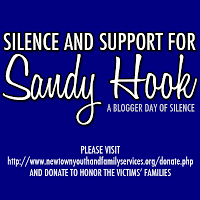 I am going to continue to pray for the families in Newtown, Connecticut. I am going to pray that Our Heavenly Father is lifting them up. ...that He is taking care of them...even more than He usually does. I'm going to stay silent. I am not going to give the enemy anymore of my tears or heartache. I am not going to let Satan win this one. ...the world ended that morning. But from the dust and ashes, we are stronger. Our families are being lifted up in prayer. They are being prayed over by their families and friends and from people they don't know. Help me and those that we pray for that they are not alone in this...ever.